8am today. Not sure what the overnight low was. Things can only go up from here... or at least the 5 day forecast thankfully shows that! Today is the kids' third day in a row off of school. Wednesday was due to a huge snowstorm. Yesterday was due to the cold. Today, they started off by saying it was a two hour delay, but they ended up having problems getting buses started (gee, wonder why!) so they ended up canceling school again. For my foreign friends, the temp in C.
Here the schools are closed today because it seems like the the windchill is going to be -25°F. Temperature in the morning was -14°F. In my entire lifetime in this country I have never seen something like this. BTW, that must sting when you breathe it in. Yep, it's definitely not "normal." LOL. A few years back it was -31, and that's the coldest temperature I've ever been in, but it's not been nearly that low in recent years, except the last couple of days. As you could see a few weeks ago, I was very surprised when it got as low as -11! You're actually right about that! lol... Back when it was -11, it ended up getting into the 20's within a day or two, and as I was walking out to my garage, the wind hit my face and I actually felt relieved at how warm it was! I guess that's how I'll feel with tomorrow's expected high of 25! I'll tell you, though, I think the ones who are the worst off are the animals. The wild ones have to be out in it 24/7. Poor ol' Puppa only has to be in it for a minute or two, but even within 30 seconds of being out there, he has a hard time walking on the freezing ground, never mind standing still to do his business! I was just thinking of that last night. Man, how that ol' furnace would be struggling in this weather, had the problem not been taken care of! 29C (90F) here in Johannesburg. 37C here, with high humidity at 78%. Who needs a sauna? Joel, why must your friends rub our noses in their comfy temps ??? Kidding aside, I am kinda jealous, sounds great. 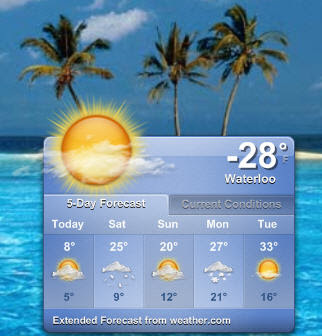 they are calling for -31 C here (Celcius...or Cannuck)...which is -23.8 American. We just sent you a little cold shoulder from the Great White North eh? Yeah... quit rubbing it in! 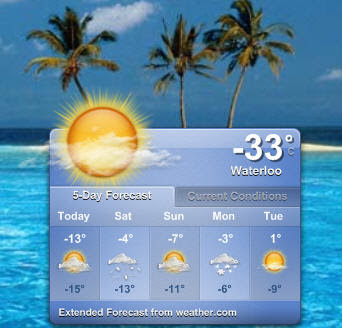 What I'd give if it would only warm up to 32º FAHRENHEIT, never mind Celsius! And yeah, WC, I think you not only sent a little cold shoulder. You added some EXTRA cold to it! No thanks! Jay, hey, cool, I know where Toddville is. I used to work for 89.1 The Spirit, which is based in Cedar Rapids (although I worked from Waterloo), and I know for sure that we had listeners in Toddville.